Correspondingly, the share of services shrinks when we use the new series. In 2011-12, services accounted for 63% of total GVA under the old measurements and 58% under the new one. The share of trade, hotels, transport and communication shrinks from 24.7% under the old series to 17.4% under the new one. That’s a substantial reduction, the reasons for which need to be explained. But the share of “financing, insurance, real estate and business services" goes up, as does the share of construction. 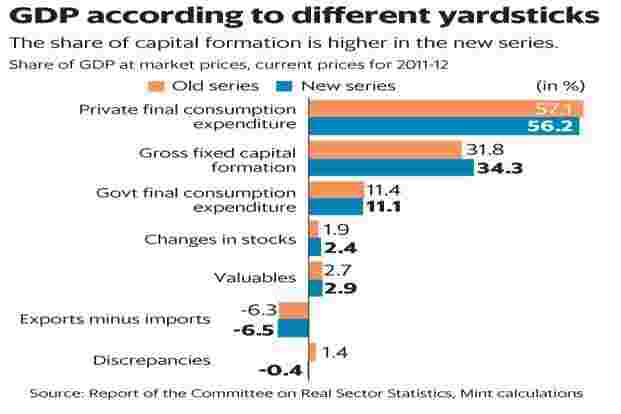 There’s another curious feature about the new GDP back series. From 1994-95 to 2002-03, growth rates under the old series at constant prices were higher every year than in the new series. But from 2003-04 onwards, growth rates have consistently been higher under the new series than under the old one. What changed in 2003-04 to alter the trend? It’s possible that some activities were measured from 2003-04 onwards but not earlier. The final data release should tell us the reasons. And finally, it’s important to note that even the data under the new back series suffers from serious limitations. A note to one of the tables on GDP in the report says, ‘‘Discrepancies found to be volatile and constant price series could not be estimated." Another table shows that discrepancies under the GDP data in the new back series range all the way from a negative ₹ 1.93 trillion in 2007-08 to a positive ₹ 1.14 trillion in 2013-14. The report says, “when we look at the growth rates, there are some differences, although not significant and this is largely due to the ‘discrepancy’ variable, which is found to be highly volatile".